Yesterday my foot got in a battle with a pin (which was hiding in my carpet) and I think it ended up bruising a bone, which has made walking, sewing, and moving pretty excruciating. So i’m not sure how productive I will be this week. But on the bright side, this has given me lot’s of time to reply to things! As some of you may know my little blog got “featured” on Buzzfeed, The Daily Dot, Fashionably Geek, Observation Deck and a few others. I’m really shocked and overwhelmed by all the views and comments but i’m also incredibly grateful and thrilled that so many people are interested in my work. I’m going to try my best to reply to all the questions, notes, asks and emails! I’ve already replied to around five hundred things on tumblr and i’m hoping to get through (most of) the backlog of emails today. If you have commented on something, and I don’t manage to get back to you i’m really sorry. I promise I read each one and always appreciate the kind words, advice, or opinions that people share, even if I don’t have the time to write responses to them all. I hope it won’t stop you from commenting in the future since I really do love hearing what each and every one of you has to say! Moving on from all that, I’m going to try and get back into the habit of blogging twice a week! I have a bunch of projects in progress, and even some that are finished but I haven’t gotten around to writing about. So I really don’t have any excuses (aside from laziness) for long waits between updates. This project was started on New Years Eve, my brother was having a party at our house that I didn’t get invited to, so I had to occupy myself upstairs. At this point I was a month into working on Elsa and really needed a break – I was going through ruffle withdrawal or something. I wanted an easy project that was different from what I had done in the past. I also wanted a project I could make with materials I had on hand. This didn’t give me a whole lot to go off of, since most of my original ideas were full length gowns that would take dozens of hours to make, and I have piles of material hanging around. 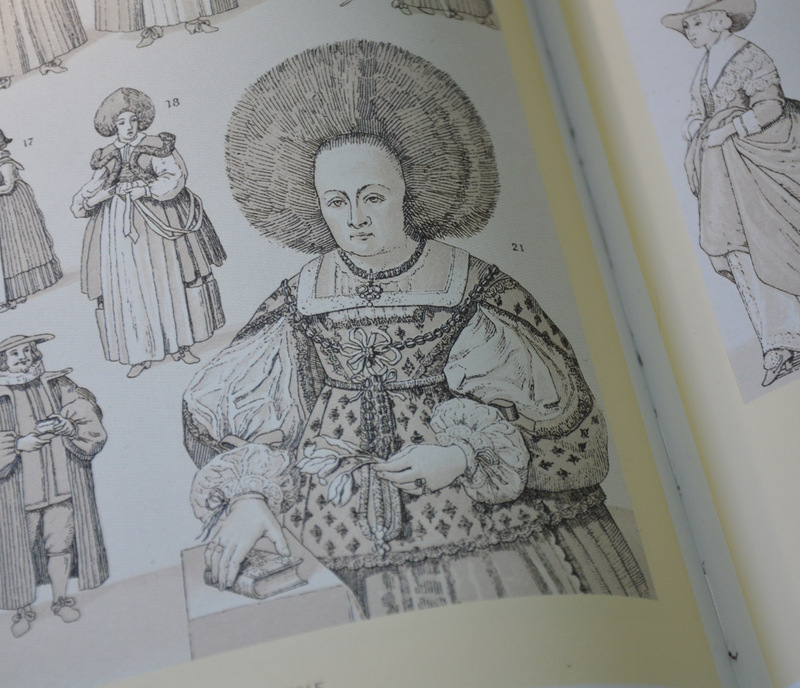 I looked through the newest addition to my little library for inspiration, which is “The Complete Costume History” by Auguste Racinet. After a bit I came across this, which is sort of hideous but really captured my attention. I loved the sleeves, the interesting trim, and how well the overdress(?) and underdress (or is it a chemise?) complimented each other. I decided I would base my newest project off of this, and use materials from an abandoned project to make the whole thing. 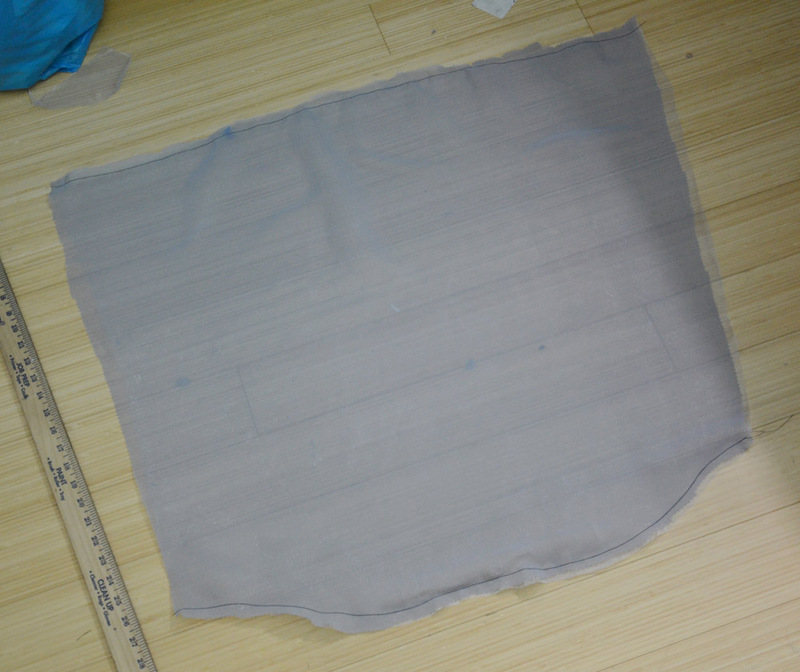 That abandoned project was supposed to be another version of Anju from Chibi Vampire, but never developed beyond a pile of grey organza (around three yards), chiffon (around three yards), and black velvet (almost two yards). 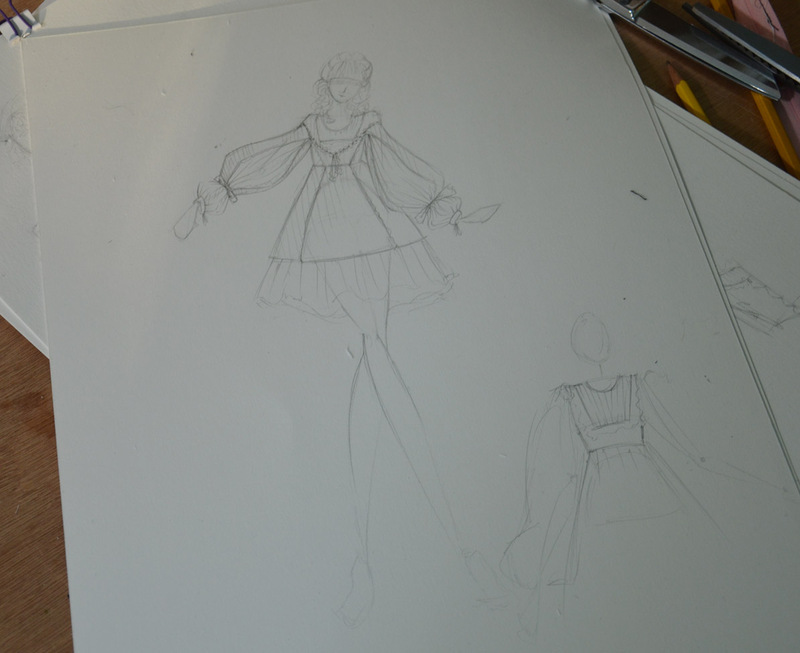 I did up a sketch of what I had in mind – due to limited materials I decided to make it short! 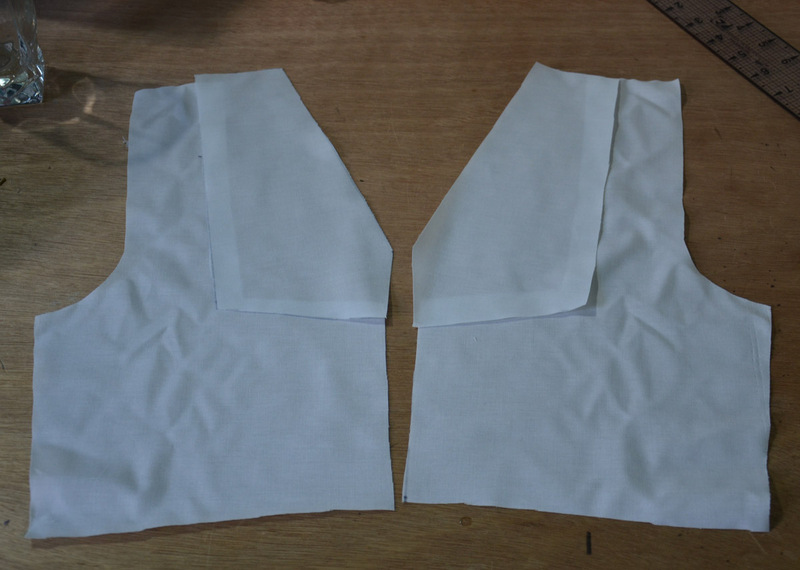 Those are all cut from white broadcloth. I covered three of the pieces in a layer of grey chiffon and set aside the others – those would be covered with gathered panels later on. 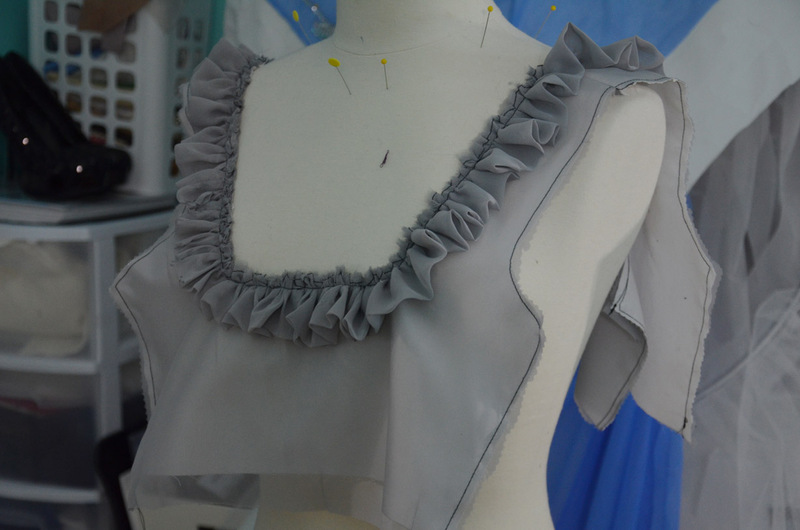 I made up little two inch ruffles to decorate the neckline. I chose to make them by folding over a four inch strip of chiffon since my top stitching on chiffon always seems to pucker. 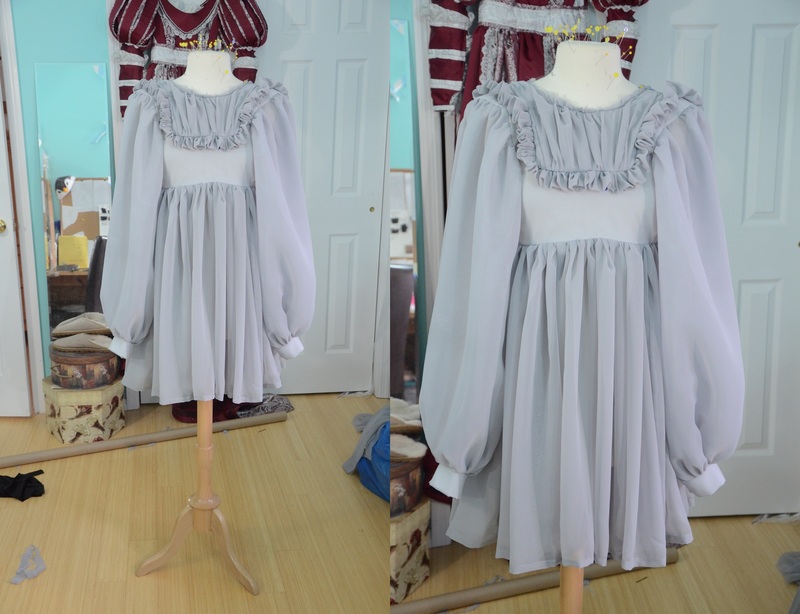 At this point I had already sewed the shoulder seams, so I could attach the ruffles without having to sew seams into them later on. I gathered the ruffles by shoving them under the presser foot as I went – not the safest or most precise method, but it’s become one of my favorites. Then I created the gathered panels, and sewed those in as well! The gathered panels were created by gathering and sewing a large rectangle of material over the smaller broadcloth pieces. I’ve used this method a lot to create puffs in sleeves and stuff. It looks a little wonky here since I hadn’t ironed it yet or clipped my corners. 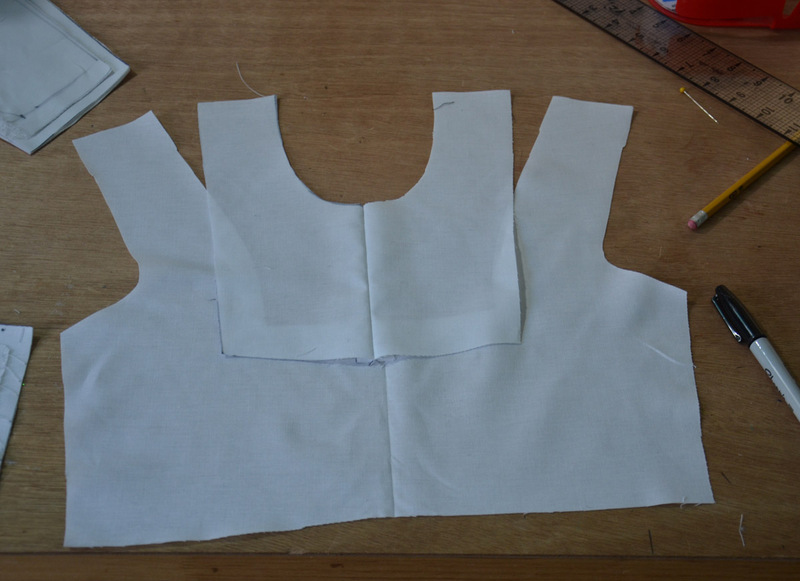 Then I started on the sleeves, which were giant! They took about a yard of material in total to make. 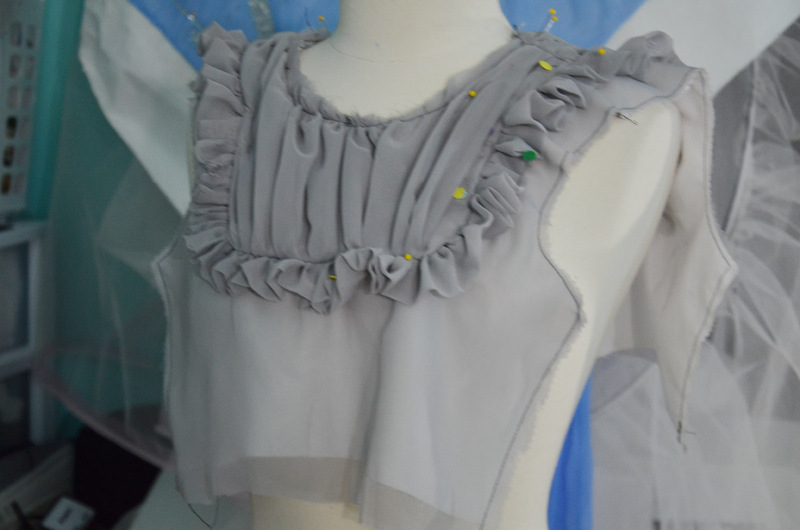 Each one is made from organza, with a top layer of chiffon. Since they are so large I knew that if used on it’s own the chiffon would collapse on itself. 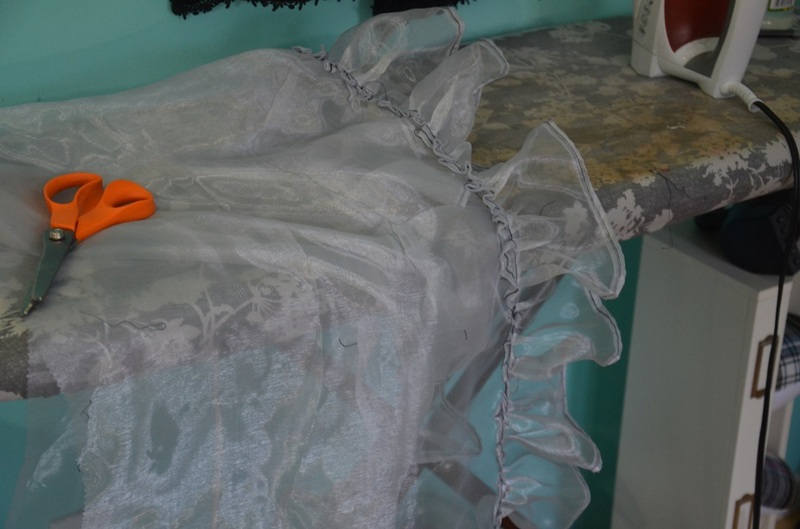 The underlayer of organza helps it keep the shape, and adds a lot of volume! 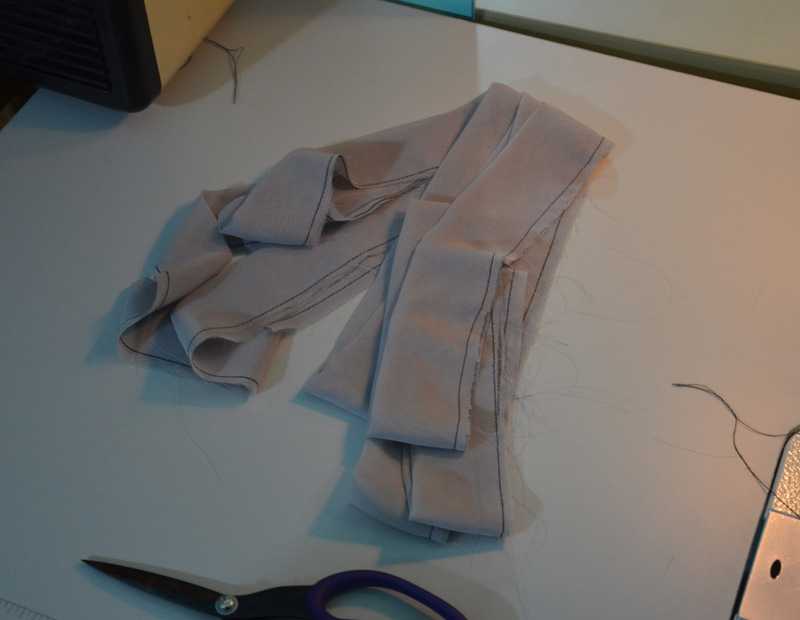 I gathered both ends of the sleeve and sewed cuffs onto the wrists. 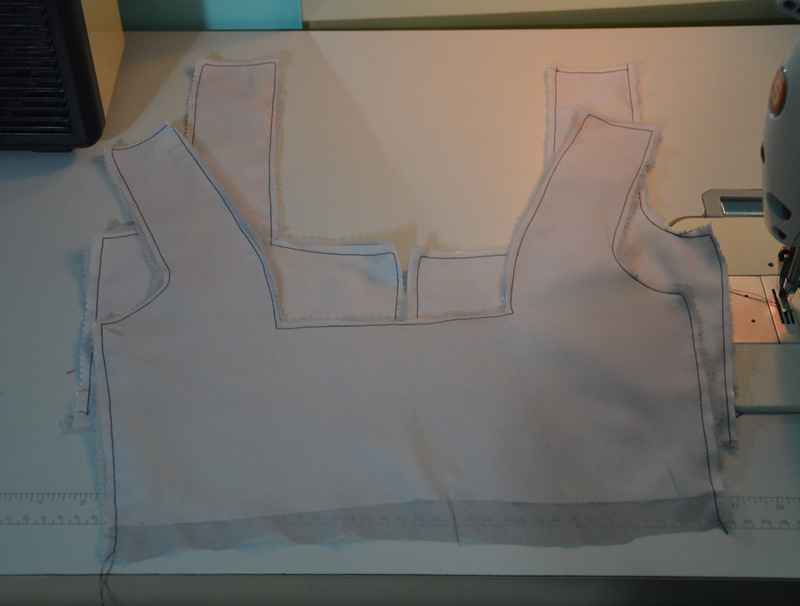 Then I sewed them onto the bodice, and moved onto the skirt! The skirt was a giant rectangle of fabric with a hand sewn rolled hem, there wasn’t anything fancy about it at all. Looking back I didn’t take any photos of this until after I had sewn it onto the bodice, oops! Even though it was almost done, I wasn’t happy with it. Though the skirt was made from a three yard length of chiffon, it had no volume whatsoever. 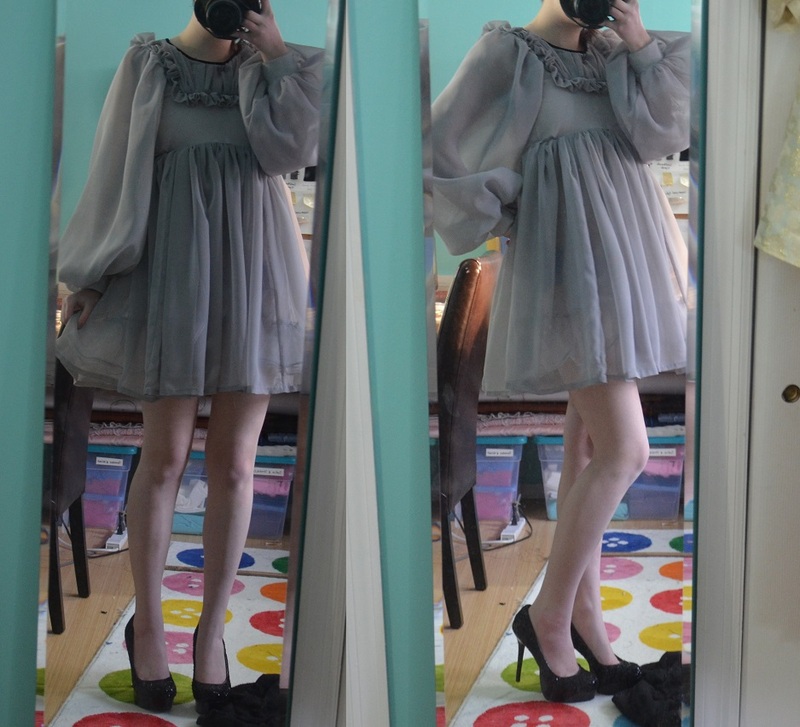 Like I had with the sleeves, I decided to fix the problem with organza. I made a little underskirt with a single ruffle to give it more volume. Then I made some piping out of black velvet, sewed it on to the neckline, and added a zipper. I was done! It’s fluffy, ruffly, and horribly unflattering. But it was the perfect side project after spending so many hours on the slinky and sparkly costume that is Elsa. 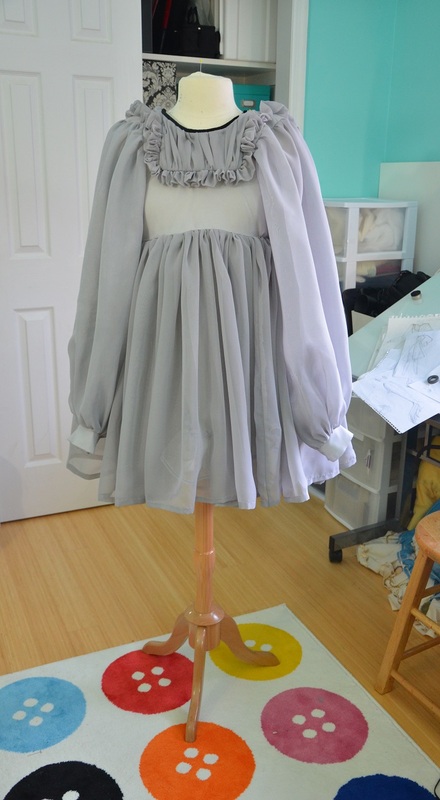 Next week I shall revisit this project and talk about making the overdress! I am so sorry for your foot. I hope you fell better soon. Hi Angela, a collogue on a drapery workroom site posted about your Elsa costume. Its truly beautiful and I expect you are going to have a great career as a designer if you want. And lucky you being close to New York and Mood and the garment district. Fabrics to die for. I wanted to share two hints for you. In our biz its important that the fabric doesn’t move and it occurred to me that the type of tables we make would have been very useful during your sequin and gluing project. I found your blog through the viral frenzy and saw it was a WordPress, so now it’s in my reader. I think your sewing and costuming skills are amazing, and I’m very much looking forward to seeing what all you create. I’m going to have fun going through your archives. Thanks for sharing! I think this is really cute, almost a baby-doll style. 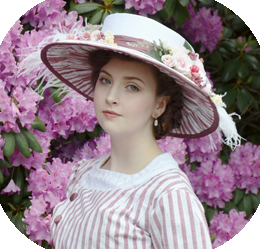 I’m so very impressed with your skill at creating patterns and dresses from almost nothing! Here’s hoping your foot gets better soon!